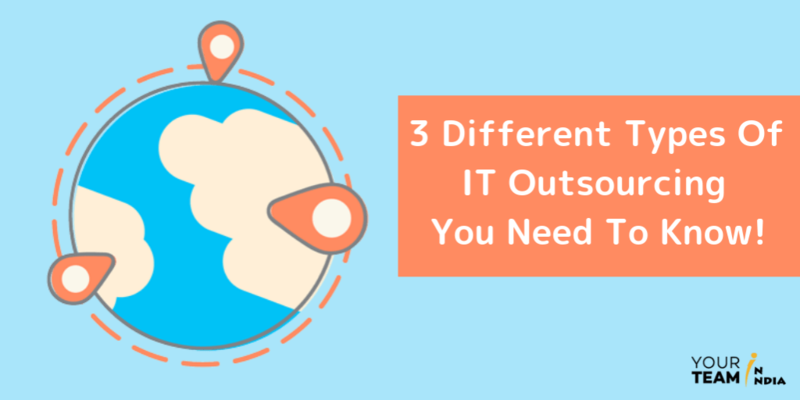 Types of Outsourcing | 3 Different IT Outsourcing You Need To Know! Every entrepreneur dreams of becoming as successful as Richard Branson, Steve Jobs, Larry Page and Warren Buffet. In today’s ultra-competitive world, entrepreneurs have been fortunate enough to have different platforms from where they can get required resources. You own an IT company and have finally decided that you need to outsource your software development project. This is certainly a very important decision, so make sure you have in-depth knowledge about outsourcing before you take the final step. With so many remote software development companies, deciding which to choose is undoubtedly a challenging task. IT Outsourcing can be defined as the strategic utilization of external IT resources. These are professionals living in different geographical locations, handling tasks and delivering functions as per requirement that is otherwise managed by internal resources. Application or software development, web development, technical support, application support, networking, data center management, data storage, and security are few of the services that can be outsourced. However, when you hire a dedicated development team and handover tasks to them, they maximize flexibility. This type of development offers a great opportunity to obtain digital transformation and growth while reducing risks and increasing profit. Outsourcing can be broadly classified into three major categories based on location. Handing over tasks to a company located in the home country or nearby region is onshore or local outsourcing. All this looks very promising and reassuring. But before you start jotting down the top local outsourcing companies in your region, you have to take care of one thing so that you don’t get disappointed. That is the cost they will charge from you. Although, there are no cultural barriers in onshore development but the operational cost is very high as compared to other outsourcing options. Countries like the USA has a very high cost of living that corresponds to high hourly rates for developers ($100-$250 on an average of approximately). It is entirely up to you if you are willing to take the risk and choose this option. But there is no guarantee that high rates will ensure high-quality results. 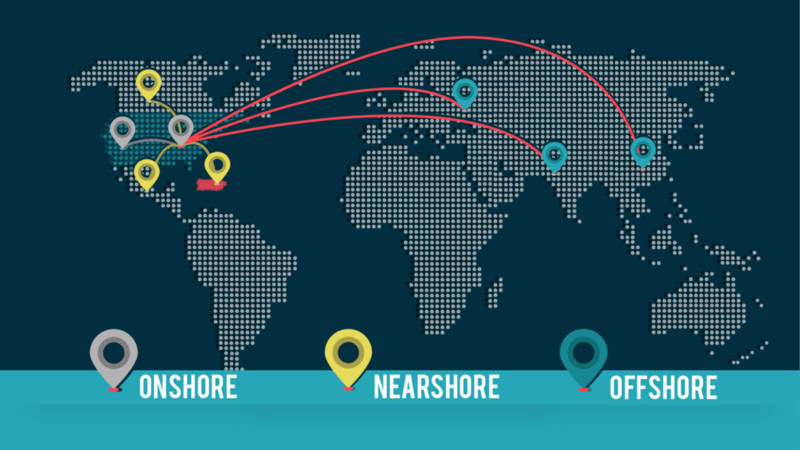 Nearshore software outsourcing is getting the work done by companies or professionals that are located in countries having similar time zones or minimal time differences. The hourly rates of the developers may vary from $25-$50. This adds up the major cost savings making everything a breeze. There have to be some similarities related to time, culture and people. Many United States companies outsource work to Canada and Mexico. Nearshoring is a good choice for projects that need innovative thinking and experimental tasks. Your product or service will not only be fully developed but fully supported by the team. Retain a good control & high responsiveness when you choose a nearshore company that will thoroughly understand your market. Everything is translated into better quality because the workers don’t have to adjust their schedule to other countries’ working hours. This one is a strategic practice where the company hires a third party or an individual from another country to perform certain tasks for your business, usually to leverage cost benefits. India is the first country that comes to mind when you think of offshore developers. Low price is the major factor. Hourly rates range from $10-$20. Surprised? Don’t be, because that’s true. Less Cost: The best thing is that the currency exchange works in your favor. It also saves you the money you would have invested in renting larger office premises or expanding already existing office. Plus, you pay only when the task is complete and not otherwise. Professionals Having Right Skills: Your business idea maybe excellent but you may not know how the task is to be performed. Round The Clock Customer Support: Connect with your customers across the globe as you provide them 24/7 assistance. Scale Your Business: This model boosts your business as the tasks are performed by experienced and highly skilled professionals. Having more time in hand, the business owner can then focus on other business objectives. Risk Mitigation: When you rely on technology, it may become outdated too quickly. And this happens quite often. The offshore development company will keep you ahead of the curve as it is always aware of the developments and changes taking place. Which One To Choose And Why? Your preference completely depends on the complexity and depth of the occurrence. Offshore Outsourcing Is A Win-Win Situation! In this world, there is nothing that can stop your search for expertise professionals overseas. When you can hire dedicated developers no matter where they are, then why settle for less? Cost of living differs from country to country. Businesses can have access to a wide pool of talent and pay them less. The employees are more than happy with their earnings. Employees are satisfied because they earn more than what they earn locally. You obviously want to connect with the customers around the clock. Or maybe you have tasks that should get complete overnight. Also, take the help of the employees who can take on the charge in the wee hours of your country. They will complete and deliver you the tasks when you and your local employees are sleeping. Depending on what you outsource, your outsourcing partner can enhance your operational efficiency, streamline communication and make it simpler for your existing team to collaborate. If you genuinely want your business to outshine and stay ahead in the competition, focus on core competencies and utilize the latest technologies. Hire remote development team to achieve all that you want to and more! Planning to develop your product/software offshore? Don’t know which outsourcing model to choose? Check this post & find out the best engagement model for offshore development!